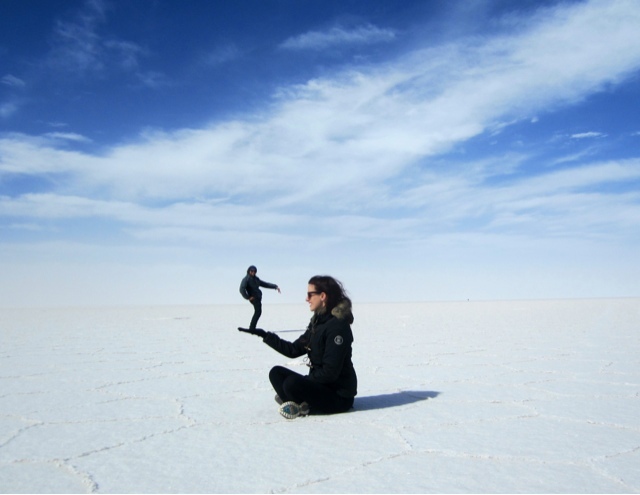 Salar de Uyuni was a beautiful nightmare. The things I saw on the tour were just so amazing and so breathtakingly beautiful. Even now when I look back at my photos it’s hard to believe I saw these things with my own eyes. It came at a big price though. 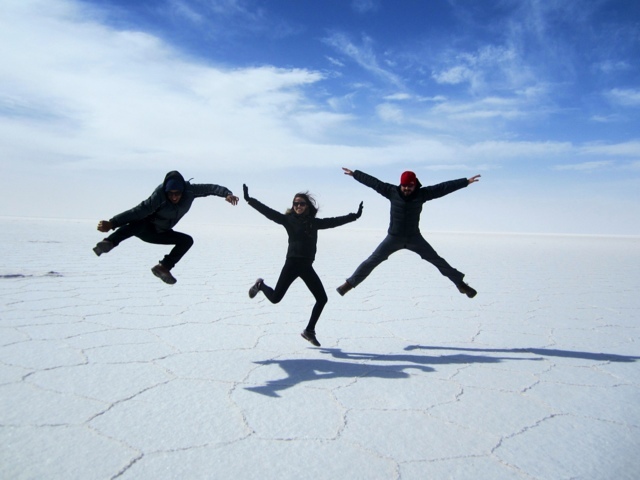 We took the over night bus from La Paz to the ugly town of uyuni. It was a nice bus rideband i slept for most of it thanks to my motion sickness pills. I was woken at 3am when the bus stopped to change drivers, it was so snowing outside!! I was so excited, I didn’t think I would be seeing snow on this trip. Little did I know that that snow nearly ruined our whole tour..
Our 10 hour bus drive turned into 12 because of the weather. 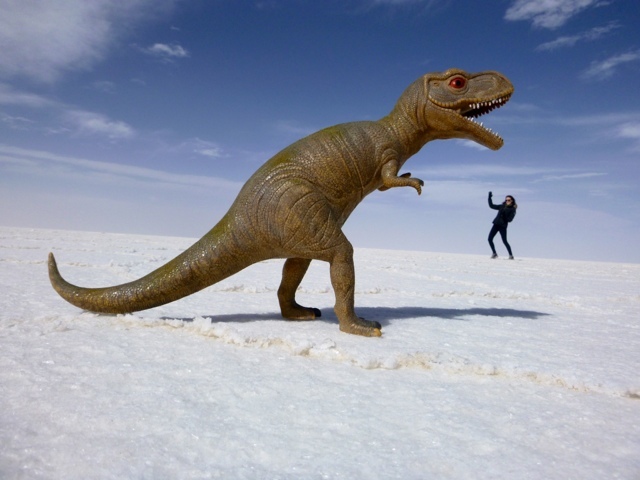 We arrived in uyuni, it was freezing, ugly and dusty. 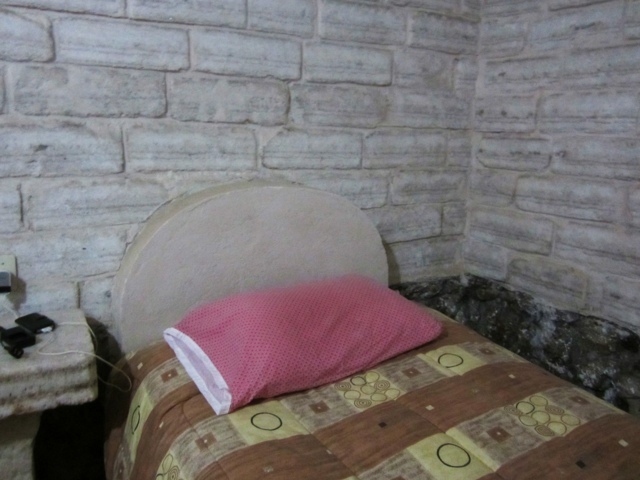 Luckily our hostel had hot showers and a heater (something we hadn’t seen in our travels so far). We got some breakfast and headed to the office of our tour company to make sure we were all good to go for the next day. 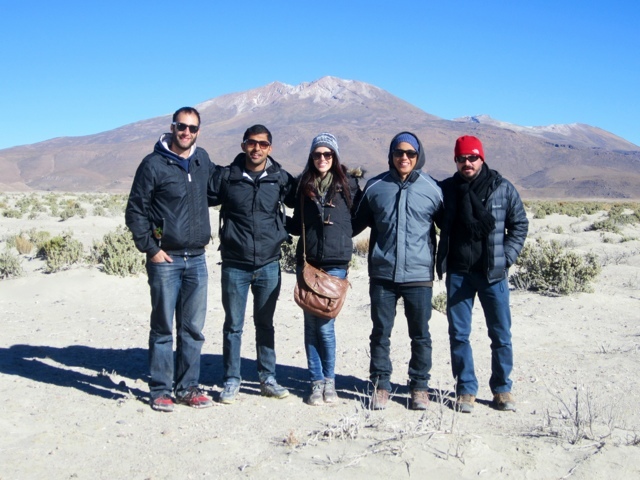 We had made a group in La Paz of five people to do our tour with. It consisted of our Romanian friend Radu from the inca trail who we had met up with again and two Aussie girls we met in La Paz, we were excited and ready to go! The lady at our tour company told us that it was most likely not possible to do half our tour because of the snow, the border to Chile was also closed so Tom and I might not make it there either. My heart sank. How annoying! Apparently they hadn’t seen that much snow in August in that area in three decades, how’s that for bad luck! Of course they wouldn’t offer a refund or an alternative, this Bolivia after all. The next morning Tom, Radu and I packed our bags and went to the office. The Aussie girls were meant to get the bus the night before and meet us there in the morning. When we got to the office we were told their bus was going to be delayed by several hours because of that stupid snow so they wouldn’t make the tour with us. Another lot of bad luck! Our car now consisted of Tom, Radu, me and two really nice French Canadian guys from Montreal. 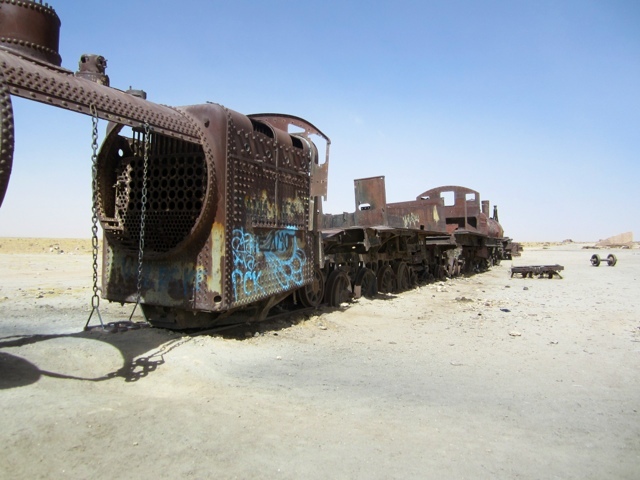 Our first stop was the train cemetery, which had a bunch of old trains there. They looked really cool against the dusty backdrop. We then stopped at a salt making factory and stopped for lunch in a place where the tables and chairs were made of salt. It was so ridiculously windy, there was a big dust storm going on. After lunch we headed to the famous salt flats. They were so beautiful. Just white as far as the eye can see in the middle of no where. It was so cold and windy, it was really hard to try and pose for those typical perspective photos everyone does there. We managed to get a few good ones though! Radu split his pants doing this jump, hilarious! We drove on a bit further until we got to Cactus Island. I was so confused as to why it was called an island until I saw it, it really is an island just surrounded by salt instead of water. It was really cool! It was so windy at the top it nearly blew me over, the wind also blew my beanie off my head, how does that even happen?! Our guide told us that winds get up to 150km in August, why didn’t anyone tell me this before? After the island we kept on driving til we reached our accommodation for the night. It was a hotel made from salt. The chairs, tables, beds, wall, everything was made of salt. It was very different. It was so cold in there though. We had dinner and sat around chatting and had a few beers. We then braved the cold and went out to look at the stars. Wow, what a sight! You could perfectly see the Milky Way in all it’s glory. Amazing! It’s so strange to be able to see the southern sky and the southern cross when I’m so far from home. It feels so comforting in a strange way. After a terrible sleep because of the cold we woke up, had breakfast and set off for the day. This day would be spent mostly bumping around in the jeep all day. We saw so many different landscapes and terrain over our 8 hours of driving. 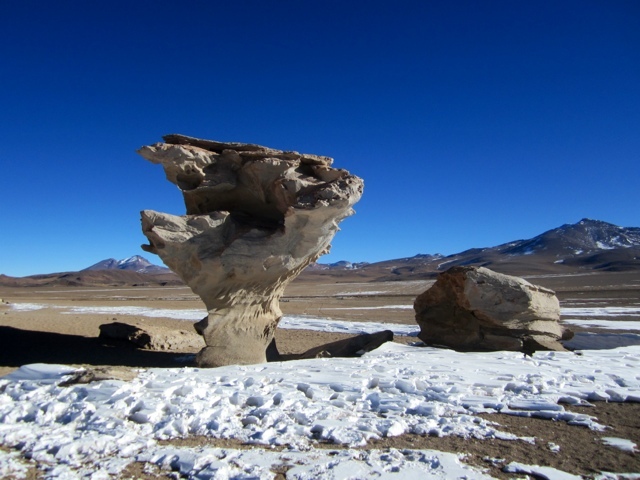 We saw big Snow capped mountains, giant rocks, snow covered desert, plenty of sand plains and my favourite of all, the Lagunas. I was so excited to see a Flamingo in the wild, I have no idea why but I was looking forward to this most in the tour. They definitely lived up to their expectations! They are such beautiful creatures and they looked absolutely breathtaking against the stunning backdrops of the snow capped mountains and the bright blue Lagunas. Every time we got out of the jeep the wind blew and the temperatures were freezing. I have honestly never been so cold in my life and I’ve done two seasons in Canada! The air was so cold and dry it actually hurt to breath it in. I was well underprepared with my cheap jacket from Cusco and my leggings. Where was my warm down jacket when I needed it! If the views weren’t so beautiful I would have hated life even more. We stopped for lunch at one of the Lagunas. We ate lunch right out the back of the jeep. How they served us hot food from the car when we had been driving for about four hours already, I will never know. Pitty once the wind got to it, it was stone cold in a second. Luckily we had some nice views to see while we ate our cold lunch and froze to death. We drove on and saw the famous tree rock. All the rocks have gotten their shape from the wind. Apparently tree rock is one of the most photographed rocks in the world. We then arrived at my favourite place of the whole tour. Laguna Colorado. At the right time of the day, with the sun in the right place the Laguna looks bright red. I cant remember exactly why (I was too cold to listen) but it has something to do with the algae, microorganisms ad thermal activity in the lake. It was so different and so amazing. 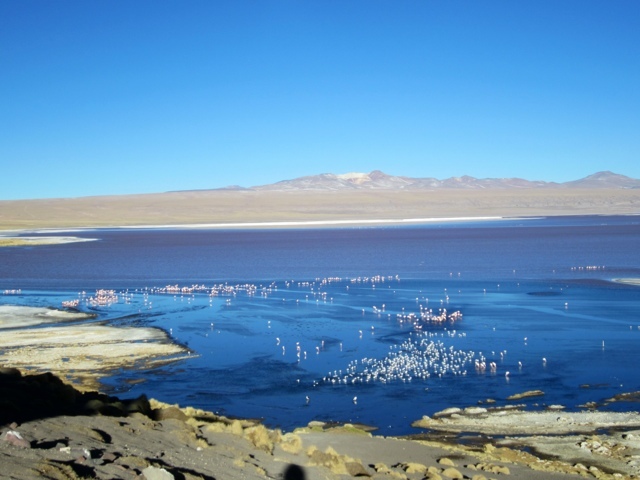 One side of the Lake is bright red and the other side was full of Flamingos. 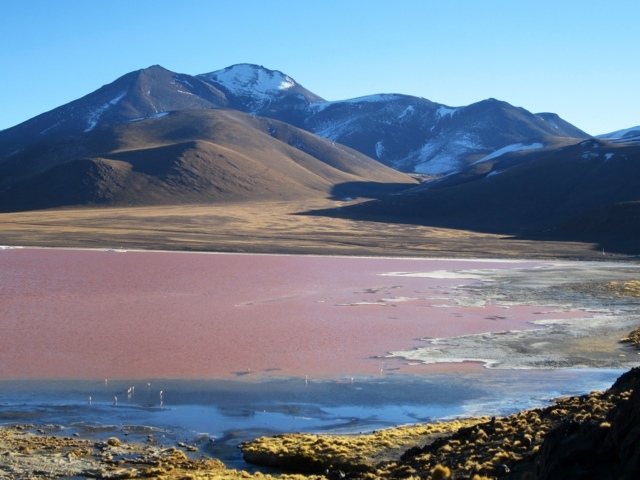 The lake is situated at 4,400 meters above sea level. It was dizzying, cold and hard to breathe. When I went in to pay the entrance fee I got dizzy and dropped my camera on the tiled floor. “Camera finito” said the man I was paying and he laughed. Yeh real funny mate! After the laguna there were a few dramas amongst our group. 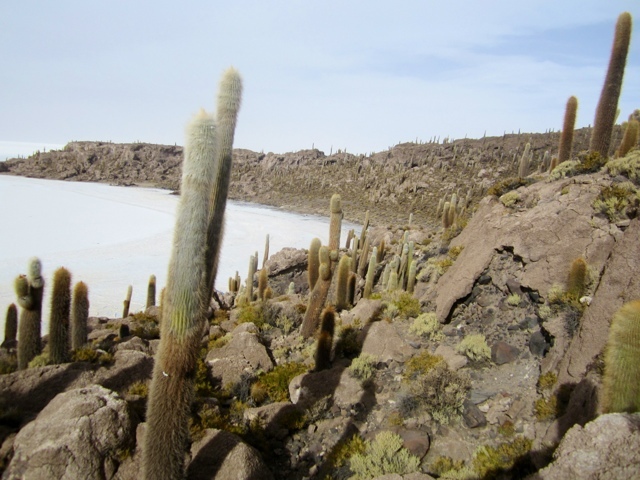 The boys were adamant that we should be able to complete the tour and do the hot springs, the geysers and Laguna Verde (green lake) but our guide and the driver were telling us it was unsafe due to possible snow and high winds. Some of the boys just wouldn’t have it and a bit argument broke out. I was too cold and dizzy to care. We had seen so many amazing things that day so I was happy and if they said it was unsafe then I believed them. Suddenly the guide started saying we now couldn’t go because Tom and I wanted to go to Chile and because the usual border was shut we now had to drive four hours to another border so there wasn’t enough time. I thought it was very unfair to blame us and I didn’t like feeling guilty and letting the rest of the group down. They shouldn’t have given us the option to go to the other border if it was going to compromise the last part of the tour. We arrived at our accommodation for the night. It wasn’t as nice as the night before and because we were still 4,400 meters high it was absolutely freezing. It was about -15 with no heating or no insulation, what a nightmare! My guide saw me shivering and gave me a hot water bottle, that was nice of him. We ate dinner and had some wine. The boys continued drinking and partying til late in the night. I went to bed early because I was feeling sick from the altitude. I didn’t sleep at all and just shook all night in my sleeping bag. When was this nightmare going to end! We got up at 5am. It had been decided that Tom and I would go in another car to Chile and the rest would head back to ‘Uyuni’. We later found out that they all got to the hot springs and the geysers. I’m really pissed off about this. 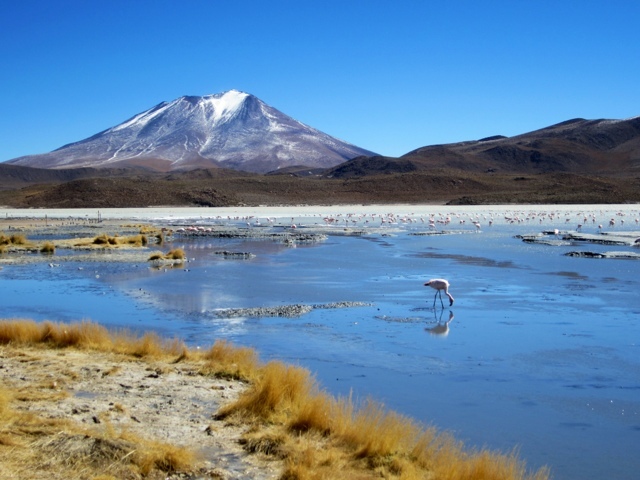 I slept most of the way to San Pedro de atacama in Chile, where we arrived to normal temperatures and I could strip off at least five layers of clothing. Even though a lot of this tour was horrible, cold and a complete nightmare I’m so happy we did it. I will never see landscapes like I did and just be completely in the middle of nowhere surrounded by nothing but nature. 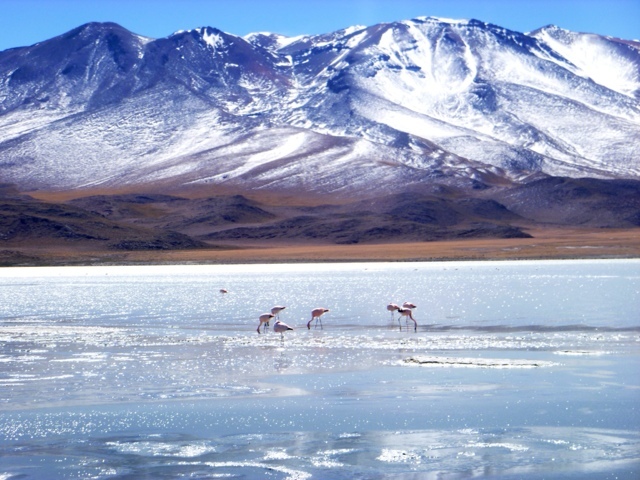 I would definitely reccomend this tour to anyone heading to Bolivia, it’s a must see! Maybe just not in winter. I would also recommend the company Red Plant, even though we had a few issues, the drivers were safe, the guide spoke English, the accommodations were bareable and the food was edible. Once again I think Boliva had challenged me and made a stronger person. I’ve gained alot of knowledge of myself and my surroundings, ive also maybe gained a few more wrinkles from all the stress it’s caused and a possible stomach parasite. Gotta love Boliva!